Ambitious plans by the Mayor of London, Sadiq Khan, and Mayor of Newham, Rokhsana Fiaz, for the £314 million regeneration of the Royal Docks in east London over the next five years have been given the green light. The creation of the Royal Docks Enterprise Zone has the potential to generate 35,000 jobs, 4,000 new homes and attract more than £5 billion in inward investment by 2037/38, according to plans authored by Mayor of London, Sadiq Khan, and Mayor of Newham, Rokhsana Fiaz. London’s only Enterprise Zone will offer a designated area where employers can access business rate relief and other financial support. The delivery plan for the 112-hectare Royal Docks Enterprise Zone was signed off by the board of the London Economic Action Partnership (LEAP), which is responsible for allocating funding raised through the Enterprise Zone. Under the new plans, an integrated package of investment in transport infrastructure, connectivity, economic development, placemaking, creative programming, promotion and estate management have been proposed to help deliver the transformation of the area. Creating an attractive waterside residential, leisure and business district for the borough of Newham and for London as a whole. Enhancing the public realm and creating high-quality spaces, ensuring the landscape reflects the area’s industrial heritage and accommodates both cultural and business uses. Significantly improving transport and digital connectivity for residents and businesses. Increasing the provision of affordable workspace by investing in underused sites and supporting the development and retention of SMEs (focussing on creative, cultural and tech companies). Developing an ambitious employment and skills programme to train local people and ensure a pipeline of skilled local staff for new and existing Royal Docks businesses. Developing an ambitious cultural programme to complement the economic transformation of the area and boost the number of visitors. Engaging the local community and businesses in and around the Royal Docks to ensure they have a stake in the area’s regeneration. 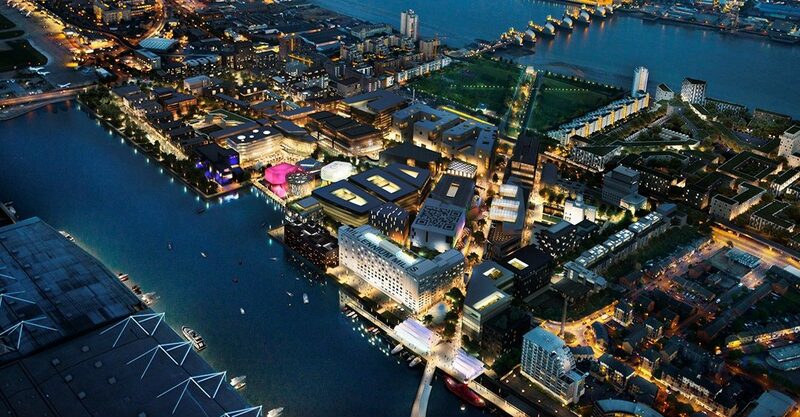 Promoting the Royal Dock as a destination which attracts talent, visitors and inward investment from around the world.